Deja vu ...All of a sudden I'm back in the South of 1976. The ol' Skydog was a senior in high school. Back in those days, and I guess it still is today, everybody had their little cliques. Some were the 'disco ducks'... you know, polyester pants and the whole bit. Listened to the mindless dance music that was beginning to take over; drum machines and synthesizers were replacing musical talent and feeling. Then there were the 'metal deads', the ones with the Led Zep shirts and the dark attitudes. Over in another corner were the 'good ol' boys'...we'd discovered a new type music (or so we thought) coming from of a bunch of bands from right around us. No English accents, no weird clothes or even weirder haircuts. Folks just like us. Jeans and cowboy hats and boots...and we could actually understand what they were saying! It all just felt right... Southern pride was on the rise... Charlie Daniels said the "South's Gonna Do It Again" and, by God, we believed him! 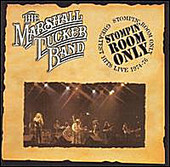 Spartanburg, and the whole state of South Carolina for that matter, had a treasure called the Marshall Tucker Band... everybody tried to figure out which one of them was Marshall Tucker, but we sure did dig the music! Absolutely killer guitar lines and a singer who really had a southern accent. This was 'our music.' Find a convenience store that wouldn't card you, buy up a few six-packs, find a hay field way out in the country... and it was party time! When I put Stompin' Room Only into the CD player... see, even us good ol' boys have joined the modern age, it was '76 all over again. It's hard to believe the tapes have sat somewhere all these years... ought to be a crime, in my humble opinion. Probably a Yankee conspiracy! All the classic MTB songs are here. Mostly recorded during a European tour in the mid-70's, SRO catches the Tucker boys in their prime, before the tragic loss of both Tommy and Toy Caldwell. "Can't You See" brings back the sweet guitar lines of lost loved ones like Toy and Tommy. "Take The Highway" and "24 Hours At A Time", just to name a couple, have that fire and drive that is so lacking in today's music. And Doug Gray still makes you hurt when he hits the high notes on 'The Thrill Is Gone" (from the 1975 Volunteer Jam) ...damn, that musta' stung... probably scarred him for life! This is not the Marshall Tucker Band of today, except for vocalist Doug Gray. These songs were recorded when Southern rock was at it's zenith...new and fresh and strong. Each and every one should stand as a benchmark for any band who wants to call themselves 'Southern' rock. You can almost see Toy and Tommy grinnin' at each other across the stage. In summary, GET THIS CD...if you ever jammed on the radio to the MTB, ever was fortunate enough to see them live, or just don't feel the fire when you listen to the latest media favorite... this is your salvation! Stompin? Room Only is available online through Marshall Tucker's website or Shout Factory, and local and online venders such as Wal-mart or Amazon.